Budget Book FY2015 was approved by the Board of Governors on April 28. Here’s an overview of highlights. How much money did the FY2014 cost-savings measures save? Departures through the Voluntary Retirement Program (VRP), a permanent reduction of operating budgets across the University, last year’s forgone salary increases, a hiring freeze and a series of local measures undertaken by Faculties and Administrative units have thus far resulted in operating savings of approximately $40 million in FY2014. The final results will be available when the financial statements are ready later this summer. Are more cuts planned for FY2015? No. We have reached the needed reductions in fiscal 2014 and we must now focus on maintaining those savings. We have also budgeted for all of our main commitments, including salary increases for all our staff, in Budget FY2015 regardless of whether the reinvestment promised by the previous government comes through. However our fiscal environment remains uncertain and we have no way of knowing at this point what changes might result from the recent elections, including whether we can count on the promised $27 million reinvestment. If this amount does not come through or is considerably smaller, it will have a significant impact on our operating revenue and might reduce our ability to limit our annual deficit and/or fund some of our strategic priorities. Budget Book projects an annual 2 per cent cut per year in the operating budgets of Faculties and Units from FY2016 to FY2019. Why is this cut necessary? Will jobs be lost? This cut will be necessary to allow McGill to put money aside for strategic priorities if the Quebec government reinvestment does not materialize as anticipated, or other unexpected shocks to our operating funding take place. This cut represents approximately a $9 million permanent reduction in expenditures each year, or a total of close to $36 million by FY2019. The amounts will be redistributed to fund strategic priorities. Each Faculty and unit will decide on how it can best reach this reduction. McGill was supposed to close FY2014 with over 300 positions less, thanks to the VRP and the hiring freeze. Was this objective reached? This objective was reached through a combination of VRP departures, the hiring freeze, attrition, and by not filling certain vacant positions. Are the new positions posted on the McGill careers page reducing the savings reached through the VRP? No. The University has kept a tight control on external new hires to make sure that the savings reached through the VRP are not eroded. The positions that were posted throughout FY2014 were in most cases filled internally. Our Collective Agreements and Staffing Policies require that positions be posted under most circumstances, even if the intent is to hire internally. In other cases, posted positions are funded by grants so they don’t impact the University’s operating budget. When will the hiring freeze of administrative and support staff end? While we have succeeded in tackling difficult reductions in our base funding without collective dismissals in FY2014, our finances will remain challenging for the foreseeable future. This means we must continue to strategically manage the hiring of administrative and support staff. What was the impact of the VRP on the faculties versus central units? In all, 136 staff departed from central units and 119 staff departed from faculties and libraries. What concrete efforts were made to deploy resources to areas affected by the VRP? The Organizational Development unit of Human Resources is supporting Faculties and units across the University who are restructuring or reviewing their processes. Why is McGill the only university to have reduced its staff numbers in FY2014 in response to the government cuts? Why are the FY12 and FY13 government cuts permanent? Our analysis showed that the new reinvestment promised by the previous Quebec government as of FY2015 would depend heavily on an optimistic outlook of Quebec’s economic performance. It was therefore imprudent to borrow from an uncertain future funding to make-up for the FY2013 and FY2014 cuts. When the cuts were announced by the government in December 2012, we were told that the $19.2 million annual cut to our base operating funding would be reinstated in FY2015, along with an additional reinvestment, or new money. However, in December 2013 the government confirmed that the $19.2 million would not be reinstated in FY2015. It became a permanent reduction in our base operating funding. To absorb this cut, we had to find ongoing savings to align our operating revenues with our expenses. Since McGill spends nearly 75 per cent of its operating budget on staff salaries and benefits, we had to face a reduction in staff. The net impact of our prudent revenue forecasts and the cost-reduction measures we implemented in FY2014 allowed us to mitigate the impact of those permanent cuts. Other universities, on the other hand, took the Ministry’s word on the temporary nature of the cuts and were counting on the reinvestment promised by the previous government. Here for instance is Concordia’s example. 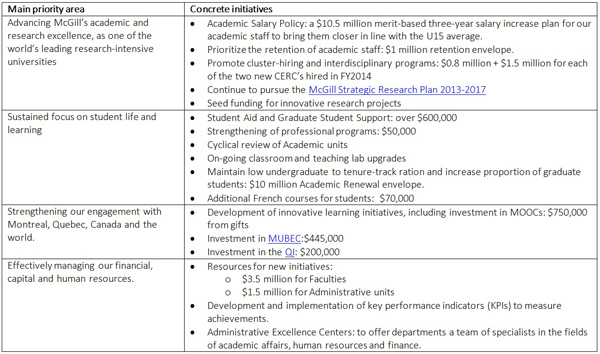 What are McGill’s priorities in FY2015? To be true to McGill’s mission, we must invest continuously and incrementally in our strategic priorities. This means setting aside envelopes from operating funds, develop strategies to generate additional revenues, both operating and capital, and encourage and foster new ways of working and collaborating to become agile and effective in the face of change. What are McGill’s main operating expenses in FY2015? Will employees receive a salary increase in FY2015? Eligible staff will receive planned increases in accordance with their respective Collective Agreements or Salary Policy. Deans and VPs have received information pertaining to the administration of these increases. For more information please speak with your manager. What main operating revenue assumptions went into planning Budget FY2015? Which of these assumptions are at risk in FY2015 following the change of government? We continue to expect the same operating revenues through the indexation of our grant and tuition revenue. We have no way of knowing at this point however, what will happen to the promised $27 million reinvestment. The new government is expected to issue a new budget expected in early June. As a result, we may have to revise our own budget sometime mid-summer. 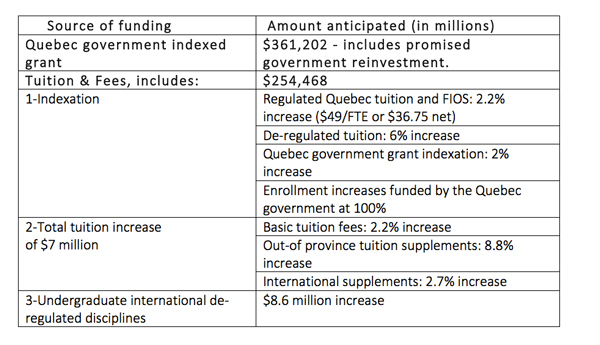 What is at risk if McGill does not receive the reinvestment promised by the previous government? We have budgeted to make sure that we will meet our main existing commitments. Those include salary increases in FY2015, pension deficit supplements and projected remaining pay-equity pay-outs. If we do not receive the reinvestment for FY2015, some of our priorities may have to see their funding either delayed or redirected. This does not mean that we will abandon our priorities. Rather we will need to find ways to pursue them with more limited means. Where needed, these decisions will be made in consultation with Deans and VPs. The government of Quebec is continuing to struggle to balance its budget. It is therefore reasonable to expect that government funding will remain limited for the foreseeable future. The plan we have built for FY2015 reflects our need to remain fiscally prudent so that we can continue to fund some of our main strategic priorities if all of our current revenue projections hold. We will also continue to work with the new Quebec government to ensure that higher education and research policies allow McGill to pursue its priorities, in alignment with its mission.